Welcome to second part of 'Java Jdbc tutorial series'.In previous discussions we came across, 'How to create a connection in JDBC ' and 'Insert data in a table in JDBC'. In this particular blog we will see 'How to create a table in jdbc' and a brief overview of 'Jdbc Statement ' and difference between them. This is the overall project structure for today's discussion, we have added a 'my-sql-connector,jar' in lib folder to make the connection happen. Please make sure that the jar file is being added to the project's classpath. 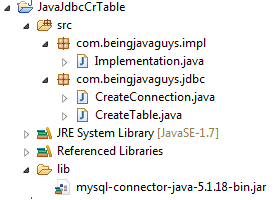 'CreateConnection.java' class contains the code to create a connection with database and 'CreateTable.java' class contains the actual code to create a table in database using JDBC. Once we are done with creating a connection to DB we are able to interact with db. To execute queries we need to obtain the object from one of the three statement interfaces provided by JDBC. Statement provides useful properties and methods to create, retrieve and manipulate data into database. JDBC defined three statement interfaces listed below. Obtain an object of Statement interface if you need to execute static queries, it does not allows runtime parameters. Statement represents basic sql queries and is a most commonly used statement in jdbc. To obtain an statement we need to call a createStatement() object on created connection. Once a Statement is obtained we can execute sql statements, sql statements can be a simple query (i.e. select) that returns a ResultSet or some operations (i.e. Delete or Update) that manipulates data into db. a) executeQuery() : This method returns a ResultSet from the provided query. b) executeUpdate() : This method is used when we don?t want any result from db but want to perform Delete or Update like operations. This method returns an integer value equivalent to number of affected rows in a table. c) execute() : Use this method when you don?t know whether a sql statement is going to return a result or manipulating the data. It returns a ?true? if a result is associated with it, in this case a ResultSet can be obtained by getResultSet() and number of updated rows can be obtained by getUpdateCount() method. Obtain an object of PreparedStatemenr if you need to use the same statement many times in your code. This type of statements are basically used to execute precompiled queries to improve performance. PreparedStatement object accepts parameters at runtime. Obtain an object of CallableStatement if you need to deal with sql stored procedures. JDBC programs are being executed using this type of statement. CallableStatement accepts runtime parameters. In this particular blog we came across how to create a table in jdbc and a brief about statement in jdbc. In upcoming blogs we will see more about JDBC including JDBC Create Connection & JDBC Inset Query & JDBC Delete and JDBC Update Implementation in Java.